You are here: Home / Guest / Congratulations, You Won a Book Award! Now What? Today’s post is a guest post from James Ventrillo, who is the president of Readers’ Favorite, which runs one of the most popular book award contests online. I reached out to him to ask if he’d be willing to share some thoughts with you about how to gain the most visibility from having an award-winning book. After all, I hope to be able to make that claim later this year, along with every other entry hopeful that applies to a book award contest. 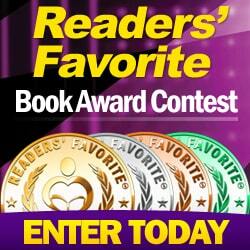 For those who are interested, the annual Readers’ Favorite book award contest is accepting entries until June 1st. Additionally, the site offers free reviews for authors. So, it’s a great resource to check out! Click here to learn more. Placing in a book award contest is no easy feat and can dramatically change the way people see you and your work, as it should. If you did not quite reach an award level, but still received an honorable mention or were a finalist, you can still get a ton of mileage from it. So here are 5 tips to help you get the most out of your new award. As an award-winner you can and should refer to yourself as an award-winning author! You should also refer to your book as an award-winning book. From now on those two words should append any mention of you and your work, from your email signature to your book’s cover. If you have a profile somewhere, update it. Wherever you are selling your book, update it. If your name or book title is out there somewhere, go slap on your new moniker and award image, you earned it! Whether it’s a professional photo at an awards ceremony or a selfie at Walmart, you need to get a bunch of photos connecting you, your book and your award; the holy trinity of your new branding effort. To do this, all of your pictures should feature you, your book, and its new award seal on the cover. When someone hears the award name, you want them to think of you and your book. When they hear your name, you want them to think of your book and your award, and when they hear of your book, you want them to think of you and the award. You want all three inextricably connected, and a great way to do that is visually. Of course, you can only take so many pictures in your living room, so you need to find some literary occasions to make the postings of these photos appropriate and interesting. Go to a place where your book is sold and take pictures next to it. Take a picture of you signing a copy for a fan or customer. Go to a book fair and exchange a copy with another author. Give away 20 books at the mall and have someone take a plethora of pictures. Become your own media circus! A good tip is to carry two copies of your book wherever you go. When you find a crowd, offer a free copy to someone and have your friend take your picture as you sign it, and hopefully a few people will come over and maybe one of them will want to buy the other copy. Worst case, more people learn about your book. I don’t need to tell you the value of social networking. Simply post all of your new pictures and book status updates to your social media sites as you are almost certainly already doing. Not great at social networking? It isn’t easy when you first get started, but it will grow slowly if you keep at it. Try the media circus idea, make your own photo ops about your book, those will always be interesting posts and will get you a lot of feedback, re-posts and new followers. Not sure which social networking site to use? Well start with the big ones: Facebook, Google+, Twitter and definitely Pinterest for all your photos. Linkedin is a good one to connect with other authors, and there are more popping up every day. But get your foot soundly in the door with the big ones first. And don’t forget to create a hashtag for you and your book. If your book is Joe Conquers the Martians, then your hashtag should be #JoeConquersTheMartians. You need to use that same hashtag on all your social networking posts and social networking sites, not just on Twitter. You can even “register” your hashtag for free at http://twubs.com. Is a press release worth it? Ehhhh… That’s a tough one. A good online press release will get you and your book name out there, but it’s a big “out there.” I would say one press release is not worth too much, unless your book is super topical. But a monthly press release, with new, relevant information about you and your book (maybe talking about your most recent media circus event), well that can add value over time with search engines and overall exposure. There are free press release services you can try, but just remember, you get what you pay for. So if you are not sure, skip the press release idea and save your money for other advertising opportunities. One idea I have seen work quite often is to contact your local media stations and try to get them to do a small story on your new award. I know this sounds daunting, but it really isn’t, you just need to know where to start, and that’s with a small radio station or local paper, you will have a better shot with them. If you can get one of them to bite, then you can mention them when you contact the next best radio station or newspaper, “I was on KJOE last week” or “The Daily Joe did a story on me” and so on. Soon you will be able to call a TV station and drop the names of several media outlets that featured you. In addition, these smaller guys will often ask you to keep them posted if you do anything. You may even be able to get some of them to publicize your media circus events. As your media attention grows, so will the size of your media circus events, which will garner more media attention and so on! Why not? That is exactly what a cover is for, to tell you what’s inside! I hope you have spent a lot of time and/or a good amount of money on your cover. It can do more to sell your book than anything else! But what about the story, isn’t that more important? Well, not really. Don’t scoff and move onto another article just yet. Think about this for a minute. You need people to read your book. You need them to post about it, talk about it, write reviews about it, and recommend it. To get that started you need them to buy it, and that begins, and sometimes ends, with the cover. Sure the story is obviously the most important part in regards to the overall success of your book, but unless their best friend said to buy your book, then the cover will be critical in grabbing the reader’s attention and in the formation of their initial opinion of the book’s quality. So before you put that shiny award seal on your cover, you need to make sure that the award enhances the image of your book, instead of your cover diminishing the value of the award. Believe me, this happens. You see a great award on a crappy cover and suddenly that award doesn’t look so good, and neither does the book. Award companies put more stock in the writing than the cover, so award-winning books with less than stellar covers is commonplace. If you want to get the most use out of your new award seal, make sure your cover looks professional. If you are not sure, go stand in the mall and ask a bunch of strangers, they will tell you the truth. Don’t forget your camera! Do you have an award-winning book? Share your title, which award you won, and a link to your book online in the comments below. I’d love to see it!